Smoant Cylon is a versatile and affordable device for every user. Powered by dual 18650 batteries, the Cylon mod is capable of running up to 218W. Adopting the updated Ant218 V2 chipset, it supports a pretty fast fire speed of 0.015s and a stable performance. The 218W Cylon also features a 1.3 inch color TFT screen with 2 UI options and a customized VW/TC curve mod. 2 colors available. The 218W Smoant Cylon is a newly designed versatile TC box mod targeting all level of vapers. Made of durable zinic alloy and high quality leather material, the Cylon mod looks high end and is comfortable to hold. It runs on dual 18650 batteries that supports a max output power of 218 watts. 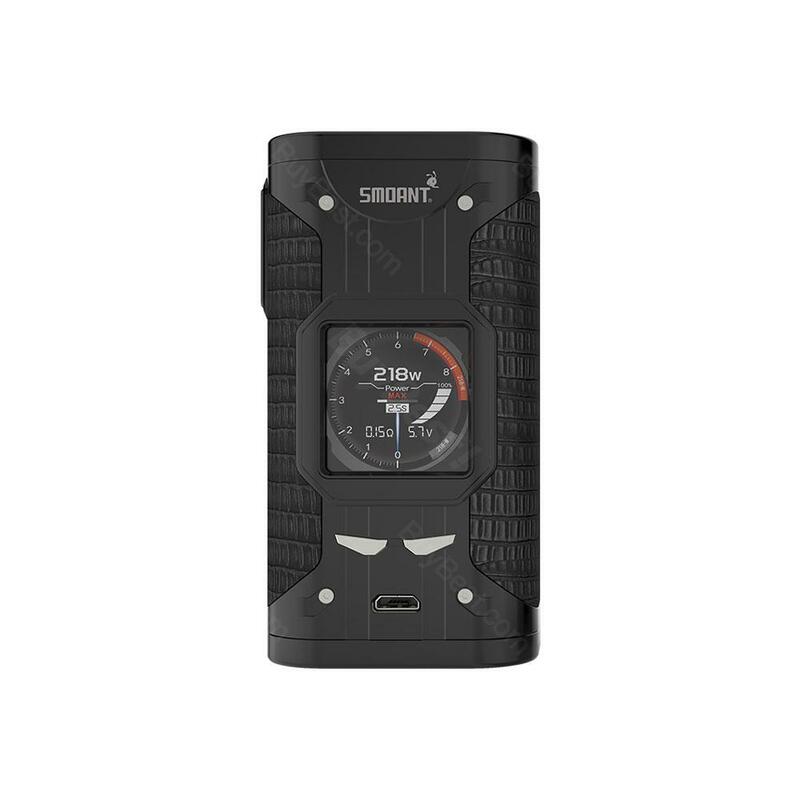 With the updated Ant218 V2 chipset, the Smoant Cylon is capable of instantly firing in only 0.015 seconds. The 1.3 inch large color TFT screen comes with an interchangeable double user interface and customizable wallpaper, bringing you different visual enjoyment. The Cylon also features a customized VW/TC curve mod to meet different vaping needs. In addition, it supports firmware upgrading and can accommodate to a 30mm atomizer. All in all, this Smoant 218W Cylon mod will bring you to a new level of vaping experience. -218W TC box mod -dual battery mod (18650 not included) -1.35 inch TFT color screen -Material: Leather, PC, Zinc Alloy -Size: (L x W x H): 1.57 x 1.26 x 3.54 inches -Weight: 0.3100 kg It's a very nice mod box. I really like the skin and the way you feel it in your hand - it's very ergonomic and grippy. The kit works very well. I like the color screen and the menu is easy to use. It is a solid mod box made of quality materials. The product got very well packed and pretty fast (about 20 days) Thank you Buybest! 218W TC box mod dual battery mod (18650 not included) 1.35 inch TFT color screen Material: Leather, PC, Zinc Alloy Size: (L x W x H): 1.57 x 1.26 x 3.54 inches Weight: 0.3100 kg It's an elegant mode box. The kite works very well. I like the color screen and the menu is easy to use. Thank you Buybest! I bought this black mod for my boyfriend. H. e is thrilled when I showed it to him. A nice choice. I really appreciate the good service from the customer service of this shop. The quality is good. I recommend it to all of you. This mod looks quite classic and elegant. The price is also friendly. Buen articulo. No ha tardado mucho y ha llegado en perfectas condiciones. I'm satisfied. Lot of features, easy to use and no tank overhang issues. Gutes Produkt kann man weiter empfehlen. Sehr zufrieden mit dem Produkt. Smoant Cylon ist fein.